Ontario, Canada — New book by Christ-follower and business professor provides insights to simplify organizations and create value for stakeholders. 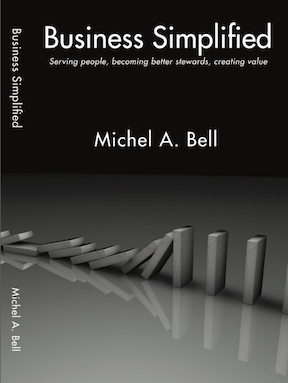 Managing God"s Money announced today publication of Michel A Bell"s sixth book, Business Simplified, serving people, becoming better stewards, and creating value. Read the full press release. Business Simplified is available in three formats. Hardcover, softcover, and ebook. Usually, prices at are discounted. The hardcover is available at Lulu only, and the softcover is available at Lulu, Amazon, Barns & Noble, and elsewhere, and as an ebook on Kindle, iBooks, and other formats. In Business Simplified,	former	business executive,	Michel A. Bell de-mystifies business with simple, helpful ideas from his experience	and	research. Business	is about people. The right people unified in the correct positions,	headed in the proper direction to delight customers	and	create	value for stakeholders. Straightforward, practical	solutions from Michel"s	vast global	business experience	and	research will enable cooperation, pinpoint suitable	paths to gain customers	for	life, and build	shareholder	value. Further insights	to design and implement	strategies for a competitive edge appear throughout	the	book. Michel cautions against so-called	five-yearly	strategic plans, which usually excludes tough choices—the essence of strategy—necessary	to	steer the entity to its	mission. Business	Simplified includes	several	case studies, explains strategic and operations	management, entrepreneurship, governance models, solution-driven marketing,	capital	and	operating budgeting, and proposes business and personal	tax	reforms. As	well, Michel offers	his	easily	understood bucket accounting ideas—the lay person"s	guide to interpreting financial	statements. Whether you are a CEO, student, or a	young entrepreneur, you	will glean valuable	insights from Business Simplified. Michel A. Bell is a follower	of Jesus, author, business professor, founder and president	of	Managing God"s Money. He	is a former senior executive with extensive	global business	experience with	the	former Alcan Inc. group. After 32 years,	in	2012, he left Alcan	as	Vice President Business	Planning for the global	bauxite, alumina and speciality	group for his current	volunteer activities in	Managing God"s Money. Michel is a Fellow of the Chartered Certified Accountants (ACCA)	of the United Kingdom and holds	a Masters of Science degree	in	Management from	the	Alfred P. Sloan	School of Management at	Massachusetts Institute	of	Technology (M.I.T). In	2015, Briercrest College and Seminary awarded Michel an	honorary doctor	of business	administration. I am sure Business Simplified will be an immense help to students and many others. Its focus on	people and strategy fits the philosophy	we followed	successfully at Alcan. Throughout Michel"s career at Alcan he lived	the	values and principles he expressed in this book. Michel Bell	has	spent his career in business, standing	apart from others, always with his insightful analysis and independent assessment of business opportunities. Never compromising his underlying beliefs and convictions, he was	resolute in making recommendations and decisions that would not benefit a few individuals but were	always for the greater good	of an organization. Michel has unparalleled business	experience with	Alcan, where he	drove a	multitude of complex international transactions	that fundamentally enhanced	the	underlying value of	the	business for the long term. He was able	to successfully	turn	what seemed	to be impossible circumstances in difficult	business environments into positive	outcomes that shifted the	direction and ultimately the performance of	the	global	business. During his fruiIul career, Michel has held various positons in the finance, legal, and business planning	sectors, and	has	lived in Montreal, Vancouver, Tokyo, UK USA, among other places. Michel will leave behind	a successful track record in planning, strategy, and business development. He has been one of the most significant contributors to the strategic positon Bauxite, Alumina, and Specialty Chemicals enjoys today. Perhaps his	greatest legacy	will be	his	value mindset, which has inspired his Alcan	colleagues.